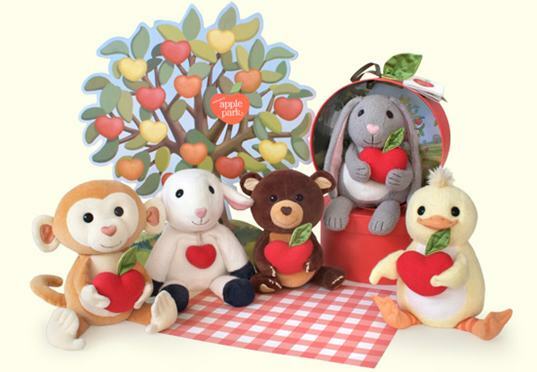 Apple Park’s Picnic Pals (Ducky, Lamby, Bunny, Cubby and Monkey), are adorable, eco-friendly, safe luxury plush friends for your little one. These smiling stuffed animals are green from top to bottom. Apple Park creates their soft fur with 100% organic cotton, and they are stuffed with a plush filling of sustainable corn fiber, 100% organic cotton and recycled, non-toxic plastic pellets. Their child-safe eyes are made of recycled, non-toxic plastic while their nose and ears are a natural silk and hemp blend. The packaging consists of a beautiful apple fruit box made of 100% recycled paper printed with soy ink and finished with a natural silk and hemp blend leaf & grosgrain ribbon handle. Perfect for gift giving — no wrapping required! Apple Park also offers sweet Apple Seed rattles available for under $15 — made with the same eco-friendly care and wrapped up in a cute apple box as well. Hello Jennifer. Really cute! I posted about these and linked to you at Tree Hugging Fam. Hey Peggy :) Thanks for the link love. They are super cute. It's the box that gets ya. Apple Park's Picnic Pals (Ducky, Lamby, Bunny, Cubby and Monkey), are adorable, eco-friendly, safe�luxury plush friends for your little one. These smiling stuffed animals are green from top to bottom. Apple Park creates their soft fur with 100% organic cotton, and they are stuffed with a plush filling of sustainable corn fiber, 100% organic cotton and recycled, non-toxic plastic pellets. Their child-safe eyes are made of recycled, non-toxic plastic while their nose and ears are a natural silk and hemp blend. The packaging consists of a beautiful apple fruit box made of 100% recycled paper printed with soy ink and finished with a natural silk and hemp blend leaf & grosgrain ribbon handle. Perfect for gift giving -- no wrapping required! Apple Park also offers sweet Apple Seed rattles available for under $15 -- made with the same eco-friendly care and wrapped up in a cute apple box as well.